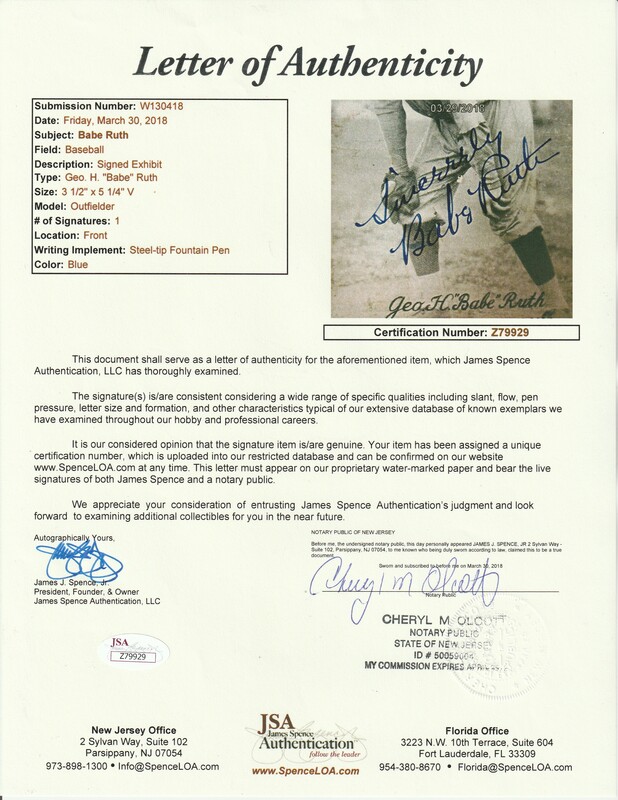 Encapsulated and assessed "Authentic" with Autograph Grade MINT 9 by BGS. Hall of Famer. 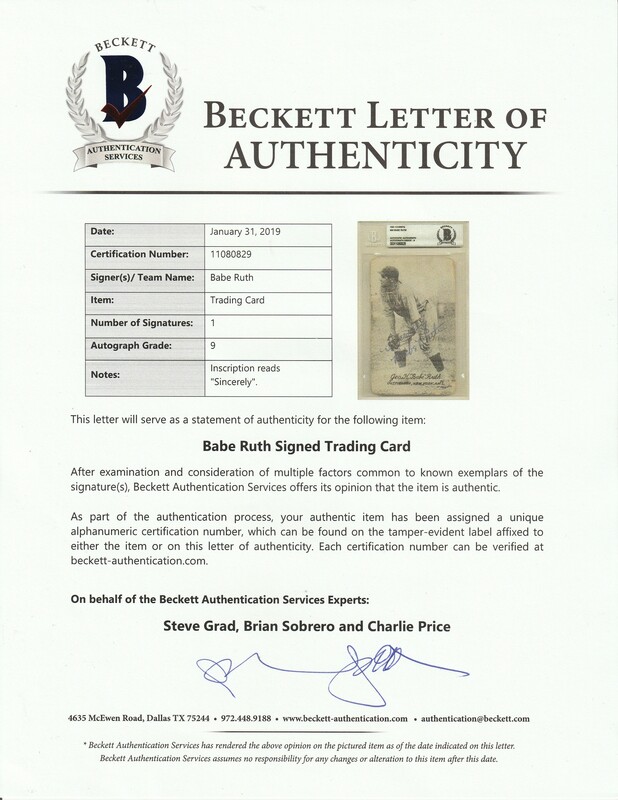 This spectacular piece's obverse signature and inscription, reading "Sincerely, Babe Ruth" and rendered in vivid blue fountain pen, projects amazing strength and clarity. A fantastic, vintage autograph, Ruth's scripting resonates with tremendous power against his on-field portrayal. This rare, arcade card collectible represents a wonderfully desirable combination of a career-contemporary relic and the enduring evidence of a long-ago encounter between a devoted fan and America's most prominent athlete of the time. 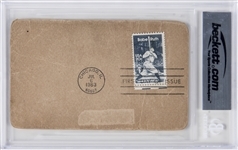 (A modern touch is visible on the card's unprinted reverse, where an example of the 1983 USPS commemorative stamp of Ruth is affixed; this collectible is adorned by an official "First Day of Issue" postal cancellation dated July 6, 1983.) 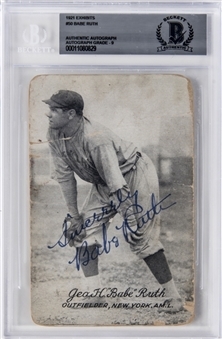 The card's front reflects moderate-to-heavy evidence of past circulation, barely affecting the captivating image and not approaching the impressive signature. 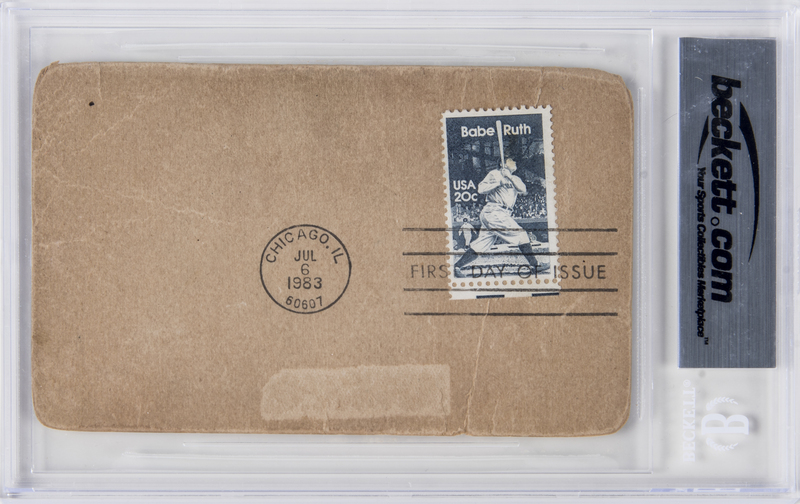 Ruth, one of Cooperstown's five original inductees in 1936, passed away in 1948. LOA from JSA (Cert. #Z79929). LOA from Beckett (Cert. #11080829).